Capital of the Indian Empire and the official residence of the Viceroy and Governor-General, situated in 22° 34′ N. and 88° 22′ E., on the east or left bank of the Hooghly river, within the Twenty-four Parganas District, Bengal. The city lies about 86 miles from the sea, and is only 18 to 21 feet above mean sea-level. Stretching northward for 6 miles along the river-bank, and bounded on the east by the Circular Canal and the Salt Lakes, it covers at the present day an area of 20,547 acres, of which only 1,792 are rural, and 1,113 acres form the Maidān. The city is bounded on all sides by suburban municipalities, which [S. 261] have been excluded from Calcutta for purposes of municipal administration. Cossipore-Chitpur on the north, Māniktala on the east, and Garden Reach on the south-west, as well as Howrah on the west bank of the Hooghly river, are industrial suburbs, which form an integral part of the life of the metropolis [Shown in Red]. The present article is, however, confined to the municipal town of Calcutta as defined in Bengal Act III of 1899, Fort William, and the water area, the population of which (1901) is 808,969, 4,612, and 34,215 respectively. 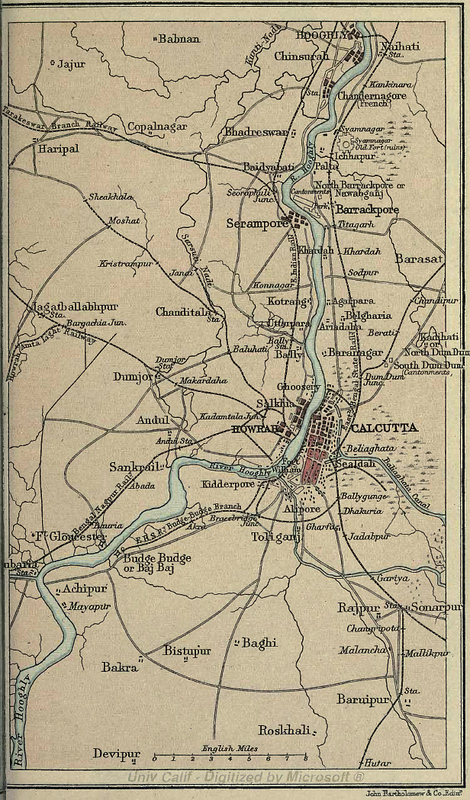 This entry was posted in Uncategorized and tagged Bartholomew, calcutta, calcutta maps, old calcutta. very beautiful map. if someone could tell me what do the red blocks represent? Thanks for your interest. Please see the notes I added.